I have been with Geneva since 2011 and it has been a wonderful journey. At first I loved Geneva for the simple fact that Aaron VanTrojen let me do my own thing and never bothered me. I made money, I worked from home and I was happy. Today I love this company because of all the wonderful support I receive from EVERYONE in the company. I'm still making money, more money than I ever thought possible. Everyday I feel backed by my operations team and this allows me to grow and give so much more to my clients. Thank you all for your continued support operations, Telle VanTrojen you really are a freaking amazing leader. For those of you who haven't had an opportunity to deal with Telle much, she NEVER stops. We are so fortunate to have these leaders who want to lead and grow. James Polinori we all see where you are taking us, we are listening. Justin E Brown you have given so much to get us where we are, thank you. Tina Larkin Rose my Compliance Queen, I'm so glad you are on our side. 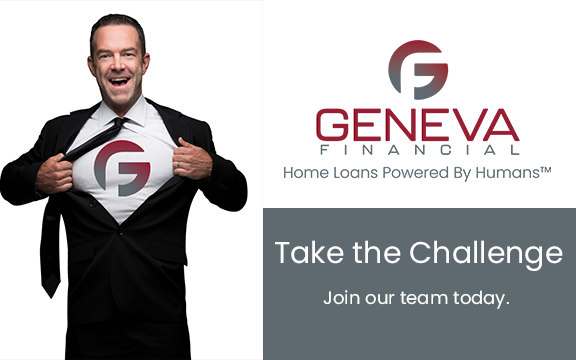 I am so proud to say I work for Geneva Financial. Do you feel the love around you? I feel most of all of our Loan Officers truly realize what a gem we have here. We are Geneva Financial, we ALL make this company great. Let's be proud and let them all see us.